The first of three essays contemplating the “complete reimagination of politics” which is the drama of Brexit. Saturday 25 March, 2017: 100,000 Remainers march to Parliament Square on the sixtieth anniversary of the Treaty of Rome. Thomas Dedes. All rights reserved.The Brexit referendum felt like a moment of rupture for all those opposed to it. It seemed so unlikely at the time, and yet it happened, and now here we are on our way out. Since then, the “Remainer” bloc (if ever there was one) seems to have splintered in two, with those who are unquestionably opposed to Brexit on one side, and on the other side those who consider that the outcome was definitive, and are now open to making the best of a bad situation. Since the referendum, people on both sides of the Remain vote have been very vocal about explaining their positions, and as a result, we seem to be faced with two completely distinct representations about what’s been happening in the UK, both articulating different sets of concerns around Brexit. Last year, I was in London conducting research among Remainers for my Master’s thesis. I had a chance to explore these different positions in depth by interviewing many people on both sides of the Remain divide. While their positions often seemed irreconcilable to me, what struck me was that the Brexit referendum somehow unleashed a complete reimagination of politics, both among those who remain completely opposed to Brexit, and those who believe that – for better or worse – the referendum result should be respected. On one side of this divide, there is a very strong and heart-felt evocation of Britain’s historically unprecedented role as a member of the EU. “We have a common heritage,” one of my interviewees told me, emphasising how the European Union had grown from an industrial cartel to a guarantor of peace in a continent which, all things considered, has been mostly marked by a long and painful history of internecine wars. As EU citizens, we can now travel, live, and work in 27 countries, and it would be insane for us to give up that privilege. On top of all this, we now live in a globalised world where bigger countries have an increasingly dominant role. In this context, the EU allowed us to have a greater impact than we might have had on our own, whilst also shielding us from the more damaging aspects of globalisation. The other side of this divide takes a less rosy view of globalisation, seeing how in recent decades it has been mostly accompanied by the wholesale outsourcing of entire industries, relentless privatisation, and especially in recent years, an increasingly toxic politics of austerity. Compared to their European counterparts, successive British governments have been particularly efficient at implementing this form of neoliberal globalisation. Elsewhere in Europe, the main driver for neoliberal reforms has often been the EU itself: think, for instance, of the troika’s role in forcing harsh rounds of austerity policies on Greece, despite large-scale popular opposition. Among the people I spoke to, many people took the view that Brexit is, in fact, going to be a big problem. But unfortunately, it simply won’t be solved by ignoring those who saw this vote as a once-in-a-lifetime chance to express their deep discontent against the Establishment – be it the EU or the British government. On one side, the UK as a global actor, with its place among its neighbours and in the larger world economy. On the other side, the UK as a deeply divided and unequal country, where the disparity between cities and countryside has never been deeper. The reason why these two narratives are so different is because each one strategically emphasises certain scales as the most important: either the European/global scale, or the local/national scale. If we think of these scales as a way to talk about belonging, then there is no reason why they should be mutually exclusive: I can feel a sense of belonging to my country or my home town, and at the same time I can feel a sense of belonging to something larger, like the EU, or – especially when talking about the environment and climate change – the world. What Brexit is doing is that it’s making it harder to feel a sense of belonging to country and continent at the same time. Taken to its extreme, we may feel like we have to choose a side: either we side with the Little Englanders, or we’re with the Liberal elite. But no matter how Brexit turns out, this distinction makes no sense: we live in a globalised world, but that does not mean that locally embedded issues of identity, agency and “control” lose all meaning. Perhaps this polarisation made tactical sense during the referendum, but it’s effectively a dead end. Rather than choosing sides, we can also look at these scales as frames through which we choose to understand the world. It might then be worth asking what, if anything, brings these two apparently irreconcilable understandings together. “A European miracle has taken place,” wrote the late sociologist Ulrich Beck in 2003. “Enemies have become neighbours! That wonder is historically unique, actually even inconceivable.” Beck argued that, although we live in a world of nation-states, there is already such a thing as a transnational European public sphere, and the realities of Europe today are “about forms and movements of ceaseless border-crossing”. The problem is that the instruments sociologists and economists typically use for analysing European society are the tools of “methodological nationalism” that were developed during the nineteenth century, in which the only legitimate category for thinking a society is that of the nation-state. Because of this overwhelming bias in the way we understand society, Beck argued that sociology has erased the “shadow realities” of actually existing cosmopolitanism: multilingualism, multinational networks, binational marriages, multiple residences, educational mobility, transnational careers, and so on. As EU citizens, these are all things that we have learned to take for granted, even when they are deeply enmeshed with the laws and structures of the nation-state. Seen from this angle, there is a deeply embedded contradiction in how the mostly affluent, educated, UK city-dwellers – relate to the EU. We wholeheartedly feel like we could make ourselves at home anywhere in Europe. We’d like to think that we can study, live and travel across 27 countries, as if borders didn’t exist. But the borders never went away. And given how Brexit is so completely based upon the idea of national sovereignty, it’s no wonder that this would come to be felt like such a violent rupture. In early 2017, Remain-voting London was brimming with talks, seminars, panel discussions, and public demonstrations, all centred around voicing opposition to Brexit, and addressing, in some form or another, the realities of a divided Britain in the early twenty-first-century. The high-watermark moment for this anti-Brexit mobilisation came on Saturday 25 March, when 100,000 people marched to Parliament Square on the sixtieth anniversary of the Treaty of Rome. 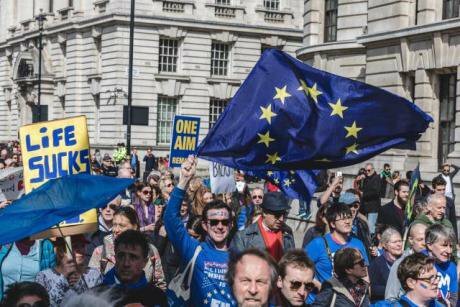 For a country that has always been perceived as being notoriously lukewarm about the EU, the Unite for Europe march really showed how deeply many people feel that they are citizens of the UK and of the EU. With the Brexit referendum and Trump’s election campaign, it has become oddly controversial to hold these sorts of views about the EU. The Remain campaign had an overwhelmingly elite feel throughout, and because of this elite support, die-hard Remainers have been labelled by some as members of an anti-patriotic, globalist, liberal elite, an imagined category of people who allegedly conspire to get rid of all nation-state borders to establish a global new world order. The scale of belonging becomes part of one’s ascribed identity, and Remainers have responded in kind. Leavers are called xenophobic, bigoted, Little Englanders, closed off from the world and utterly repelled by anything foreign. One of the most obvious outcomes of the Brexit referendum was that Britain, and especially England, turned out to be a far more divided country than most people cared to acknowledge, with the country more or less evenly split based on education, age, occupation, and place. Clearly, the Brexit referendum did not produce any of these cleavages, it merely made them perceptible and extended them into completely opposed orientations towards the world, clashing scales that have become proxies for political opinion. Amid this polarisation, however, many Remainers have also attempted to take the local dimension of the Brexit vote seriously, on its own terms. After the Brexit vote, the Labour party was faced with an uneasy situation. According to estimates, most constituencies where Remain support was the highest voted Labour in the 2015 general elections, and yet, seven out of ten Labour MPs represent constituencies that voted Leave. The Brexit referendum revealed a tremendous gap at the heart of the Labour vote, which, in many ways, mirrors England’s problem with Brexit in general. Broadly speaking, Labour-held cities in England with large student populations and/or a growing “professional” class registered a higher share for Remain, while post-industrial towns and rural areas with an older, predominantly working-class population voted for Leave. According to a study published in The Political Quarterly shortly before the Brexit referendum, “two versions of England” are emerging, in which “geographical differences have not only become sharper but have also developed a strong cultural dimension”. The trend in England is part of a wider “pattern of change that can be seen in contemporary democracies, between cities and regions that are booming and creating high-skill, high-paid jobs and those that are declining and increasingly dominated by low-skill, low-paid jobs”. But social-economic factors are not the only reasons why people voted for Brexit. After the referendum, many researchers highlighted how the articulation of identities, collective memories and notions of community all came to a head during the Brexit referendum campaign. While all the specific cases differ, many agree that there has been a sharp deficit of belonging felt at the local level, and this has had deep repercussions on people’s political orientations. In Margate, “the referendum was less about migrants or opposing nations and more about what should not be forgotten—the working-class makers, the war-fought past, and particular experiences of the world”. Others highlight the impact of Thatcher’s programme of de-industrialisation in the 1980s in towns like Doncaster, which meant not only that jobs were lost, “but also the very activities that gave locals a sense of community, identity, certainty, dignity and friendship”. Many of these areas are (or used to be) Labour strongholds, but New Labour’s neglect of its traditional, industrial working-class voter base in favour of a middle ground politics composed of middle-class professionals and other voters aspiring to middle-class status left a political vacuum in working-class areas that was quickly occupied by far-right, populist parties from the early 2000s onwards. Taken together, these elements have contributed to a feeling of disconnection between the life that is lived at the scale of the local community, and the life that is governed from afar, be it from Westminster or from Brussels. This is more or less the kind of narrative that “Re-Leavers” (a term coined by YouGov) tend to express, and the emphasis placed here departs completely from both the Remainer narrative, and from the government’s own “Global Britain” Hard Brexit fantasy. But on both sides of the Remain divide, the one thing in common is the fact that Brexit, and the feeling of harm that came from it, has more or less galvanised these new debates. Whether it’s from a European perspective or from a local perspective, or whether it’s with an eye to the past or facing an uncertain future, Brexit remains a problem with no easy solution. The UK is still very much in an in-between phase. However, things are moving forward, and Brexit has unwittingly triggered a whole new wave of political participation that would hardly have happened otherwise. The implications of Brexit might be scary, but in practice, this is the biggest political opportunity in a long time to change the basic functioning of politics in the UK.